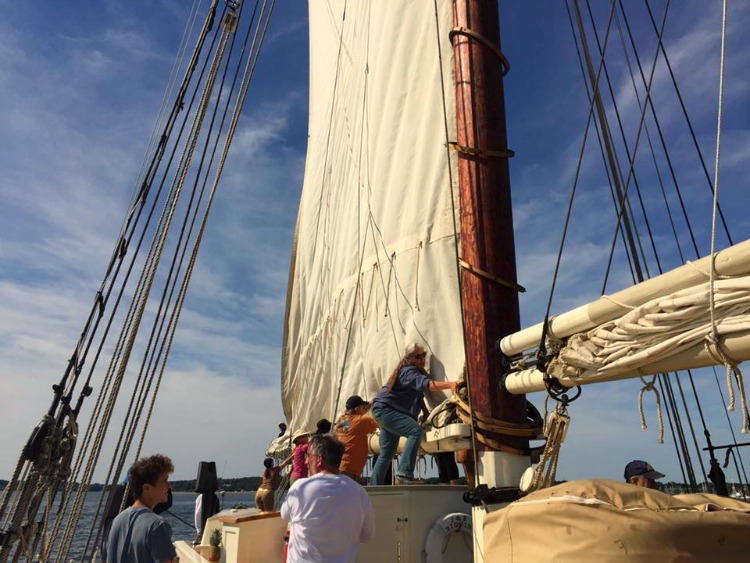 When you receive an invitation to sail on a 100+-year-old sailboat along the mid-coast of Maine, you say yes. And you say it with enthusiasm. I mean, what could be better? Iconic lighthouses, lobster rolls, idyllic sailing conditions and adventure. Count me in. When I e-mailed Vanessa with the idea, she was all in, too—minus the lobster rolls because she’s allergic and doesn’t want to die. As plans developed, we learned that we would only be on board for one night at the end of their four-night adventure. Still good. We also learned that the ship has the capacity for 24 passengers…not a problem. And two bathrooms…um, what??? Screeching halt. According to all reports, this is not a problem. Guests manage to work around the two-bathroom deal, despite the number of passengers on board. Now I can barely share a bathroom with my husband, but if they can do it, we can do it, right? 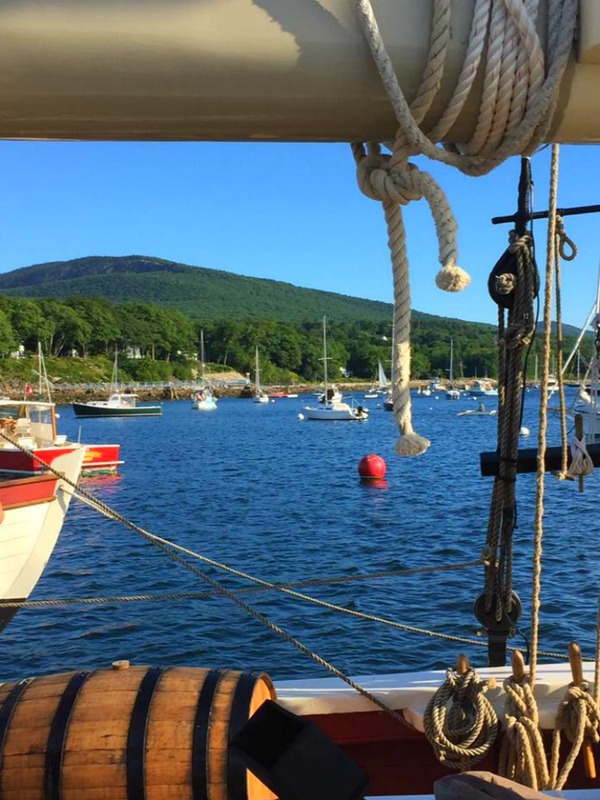 We arrived in Camden, Maine, in time for the annual Windjammer Festival—as did our ship. We watched with wonder as the captains of the J.&E. Riggin expertly navigated the majestic sailboat into Camden Harbor—Annie, who was in a small dinghy directing the non-motorized ship, and her husband, Jon, at the wheel. It was an impressive show and we couldn’t wait to climb aboard to meet our shipmates. As we climbed the ladder, the first words we heard were “Get Out!” What? We froze. Had someone called ahead and warned them about our antics? Did they know that we’d already made a pit stop at the New Hampshire Liquor Outlet, aka the Booze Barn, a massive warehouse on I-95 that is filled with discount alcohol? We soon realized that the source of this non-welcome was our friend and fellow travel writer, Deb, who had spent a week with us in Big Bend, Texas. So she actually knew enough about us to try to prevent us from getting on the ship. Turns out, she’d been onboard for the entire time with her husband, and had no idea the two journalists they’d been told were joining the trip would be us. It was quite the coincidence, and we were glad that she was kidding. (She was kidding, right?) Happily, we wouldn’t be tossed overboard BEFORE the ship even set sail. The festival was a thing of beauty as windjammers from all over the region sailed into the harbor. 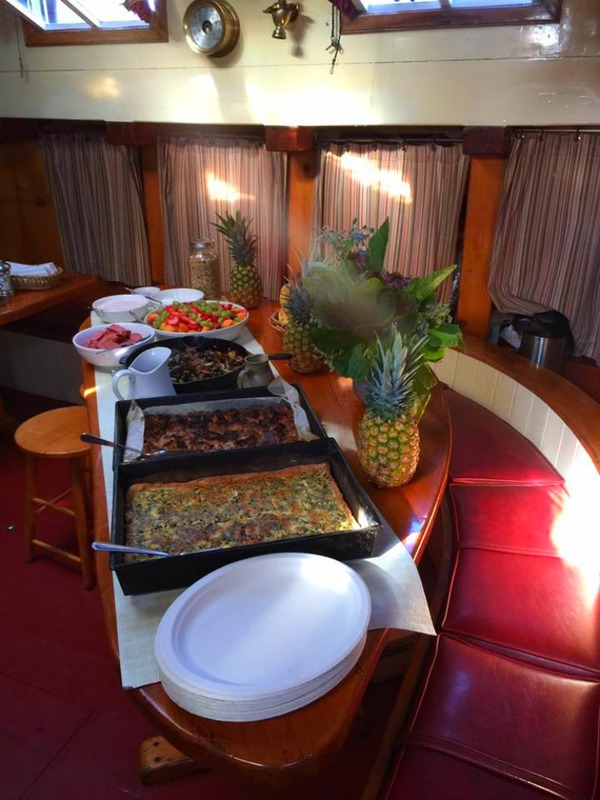 We dined with our new shipmates on extraordinary cuisine prepared by Captain Annie, a renowned chef and author of the Sugar & Salt cookbook series, whose recipes have been featured on The Today Show and Throwdown with Bobby Flay. I still can’t figure out how she whips up such masterpieces—poached salmon with tri-pepper salsa or a piece of strawberry shortcake, anyone?—in a galley so small that it makes my New York City apartment kitchen seem spacious. After dinner, we all sat on the grassy hill near the harbor for the annual talent show, featuring participants from each of the sailboats. Thankfully, no one asked us to perform. It was an altogether lovely evening until it was time for us to head to our cabin for the night. Back it up…it’s the only way to get down to the cabin! Terri: Wow, this is really tiny. Vanessa: Yes, and we’re not. Terri: And the top bunk is really close to the ceiling. Vanessa: The word you’re looking for is claustrophobic. Terri: It’ll be okay. We’ll be asleep. Vanessa: Sure. For those precious moments between panic attacks. 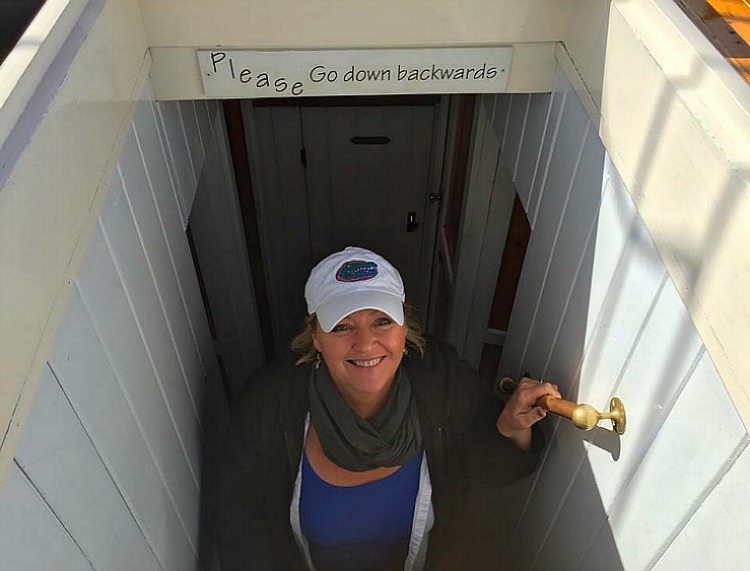 Did I mention that the ship is over 100 years old and Vanessa has a serious fear of small, enclosed spaces? Apparently, people were much smaller then, because our…um, let’s call it cozy…cabin was obviously built with someone much tinier than us in mind. Like an elf. Or a Chihuahua. There were two built-in bunks—one on the floor and one perpendicular, mounted on the wall above. The rest of the room was taken up by a tiny sink. Seriously. The REST of the room. Terri: You have to sleep on the top bunk. Vanessa: Why can’t you climb up there? Terri: I’m old. I’m short. I’m going to get up to pee during the night. I’m going to fall on you when I get up. Vanessa: So either way, I won’t make it through the night. This is the ENTIRE cabin!! The idea of gently rocking to sleep on a creaking sailboat is lovely, but that’s not exactly what happened. You see, I talk in my sleep—full sentences, from what I understand—and Vanessa snores. This means we can never both be asleep at the same time (and no one around us can get to sleep at all). Vanessa: I’m hyperventilating. Does that count? Terri: I have to go to the bathroom. Vanessa: Let me know if there’s more room there. While I had hoped to avoid the bathroom (or “head” in ship speak), nature was calling. I just kept thinking about the math—24 guests, 2 bathrooms, 4 days. That’s 12 butts on every toilet seat, now including mine. And while the bathrooms were perfectly clean, they were also half the size of the cabin. And they contained a shower, which I guess you used while sitting on the seat? I never did figure it out. Anyway, I squeezed myself out of the room, up the steep staircase, down the next staircase and into the head without any incident. I returned to find Vanessa still awake, counting the minutes until morning. Until she finally started snoring. Again. 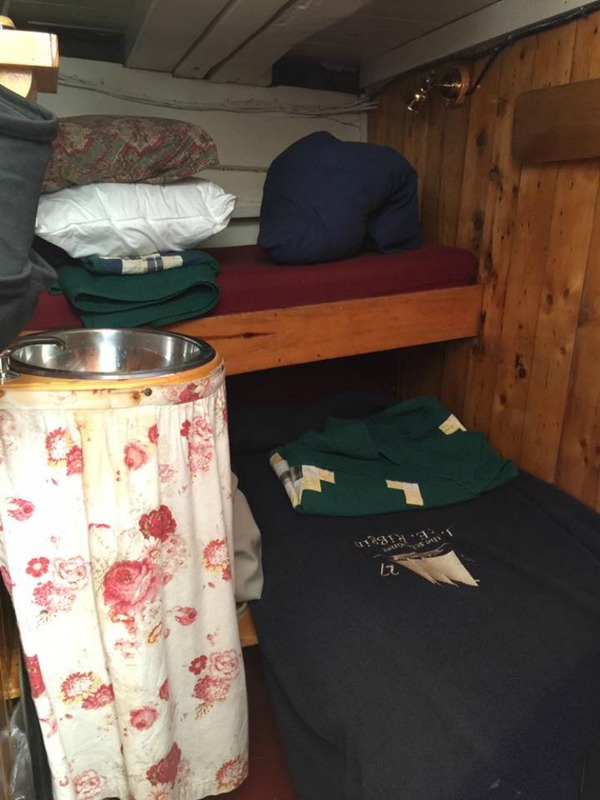 We were told later that some people choose to take a sleeping bag and spend the night out on the deck under the stars instead of in the cabins…some good information to know if, like us, you consider a king bed to be slightly on the small side. Our delicious breakfast spread whipped up in the tiniest of kitchens! Eventually we each managed to sleep and awoke to an absolutely perfect morning. The J.&E. 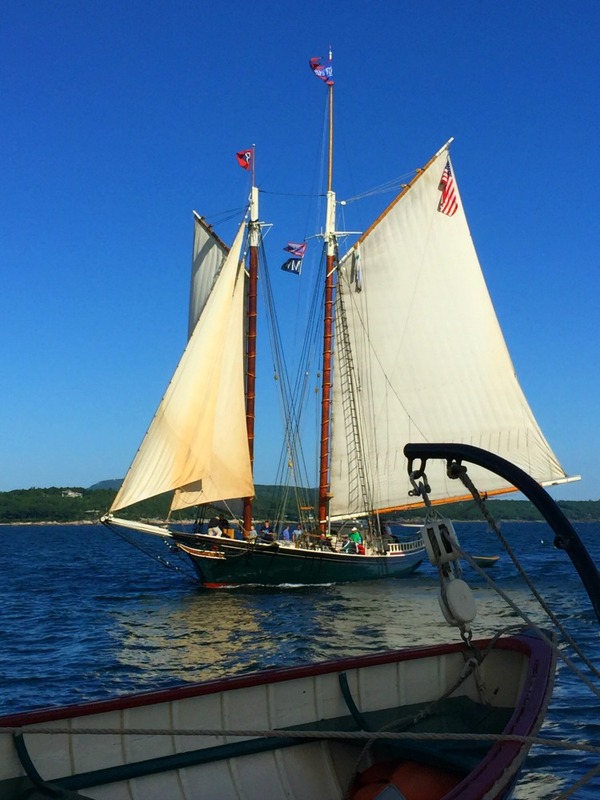 Riggin is a true sailing vessel with no motor—all you hear is the sound of the rasping wood as it gently rocks its way through Penobscot Bay. The views, from the rocky shoreline to the endless blue horizon, to the millions of stars overhead at night, create a feeling that’s hard to describe—windjammer fans describe it as a transformation in all who climb aboard…and we saw it in our shipmates. It was evident that those who had been on board for the week had bonded through their experiences. The camaraderie was contagious. Everyone joined in the daily tasks of hoisting the sails, maneuvering into the harbor and helping with clean-up after meals. The crew was more than willing to show anyone who wanted to learn how to work the ship, and most of the passengers jumped up at the slightest chance to participate. Terri: We should help them hoist the sails. Vanessa: Do we know how to hoist sails? Terri: No, but we do a lot of things we’re bad at. Vanessa: I’m too tired to hoist anything. Unless one of those sails doubles as a roll-out bed. Then I’m on it. Terri: We’re writers. Maybe we should just observe. So we watched as everyone cheerily worked. And we realized that the experience of spending those days onboard the J.&E. Riggin had given our shipmates priceless memories…as well as some serious hoisting muscles. Our work is to share the story of the J.&E. Riggin with you. Because we’re givers. Everyone pitches in to raise the sails…well, except us. We took photos. Originally built in 1929 by Charles Riggin, a fisherman who named the ship after his two sons, Jacob and Edward, the J.&E. Riggin began as an oyster schooner. Now a National Historic Landmark, the ship is owned by Captain Jon Finger and his wife, Chef/Captain Annie Mahle, who are absolutely lovely and obviously adore each other, which is good since they stay in those cabins for months. Guests can choose from three-, four- or six-day windjammer cruises from June to October. For more information, visit www.mainewindjammer.com. Insider Tip: Find a (really small) cabin mate who doesn’t talk in his/her sleep or snore. Otherwise, get your own room.